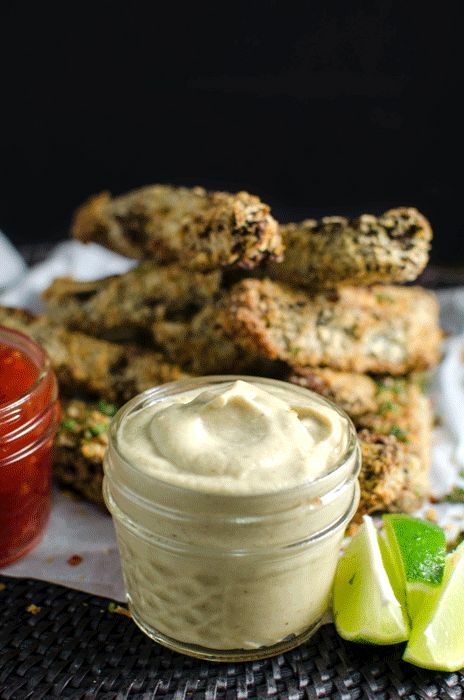 Crispy on the outside and deliciously meaty on the inside, coated with a spiced “egg wash” and a spiced cilantro salt, and then served with a vegan aioli dip made with roasted eggplants, these Baked Vegan Mushroom Fries with Vegan Aioli are an incredibly flavourful twist on a classic, that’s perfect as a party or game day appetizer or even a complete meal! Have I told you guys about my mission to get my husband to eat meatless meals? Not for any other reason other than to prove him wrong when he says that he can’t think of a great meal without meat or fish. 🙂 I do like eating meat, just as much as I like my veggies. I’ve been exclusively vegetarian for periods of time in the past, so I know I could easily slip back into it if I wanted to, as long as I have some variety of veggies and really great flavour! Especially flavour. So I made it my mission to feed him some vegetarian and vegan meals and see if he’s ready for a change of heart. And to that end, these Cilantro and Ginger Mushroom Fries with Vegan Aioli (made with roasted eggplant) were an absolute home run! 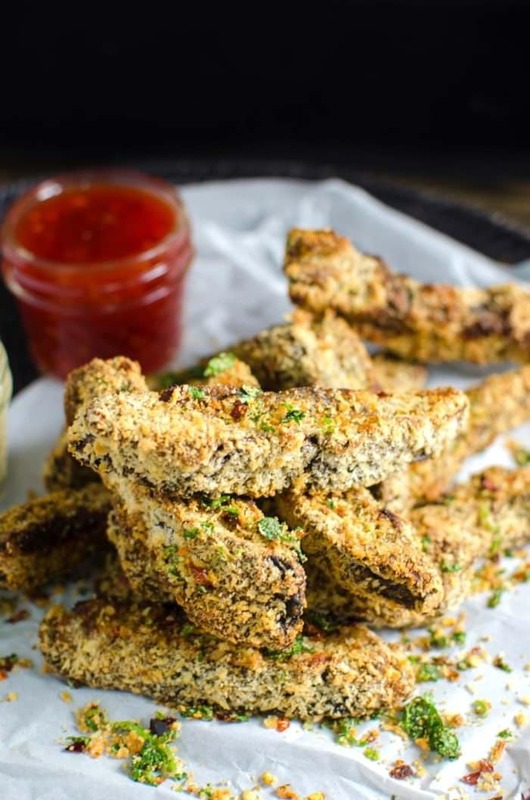 🙂 Crispy and baked to a golden brown on the outside and so deliciously meaty on the inside, you won’t even miss the meat with these mushroom “fries”, and they are dangerously addictive. So much so that I barely get to try them when I make these, because my husband practically inhales them! And they are vegan to boot. Mission accomplished. It’s not the first time I have surprised him into a fantastic meat free meal. Just recently we had these Spinach and Mushroom Polenta Stacks that were so flavourful and comforting. So was this delicious Roasted Eggplant Caponata with Pasta. These portobello mushroom fries are vegan. I used a coconut milk, chia seeds and spice mix to coat the mushroom slices. But I have also made these with regular milk, spices and an egg mix too. So if you don’t want them vegan, you can use a regular egg mix instead. And that aioli. SO SO SO SO freaking GOOOOOD! Even if you’re not vegan, you should try it like this with roasted eggplant. It’s like a creamy Babaganoush and I know you’ll love it too. But if you choose not to heed my advice, you can serve these mushroom fries with regular mayonnaise or your favourite dip (vegan or otherwise). We had these with my best spicy sweet chilli sauce! I used panko crumbs to coat them because they always give such beautifully crispy results, but you can use gluten-free breadcrumbs if you’d like to keep these gluten free. 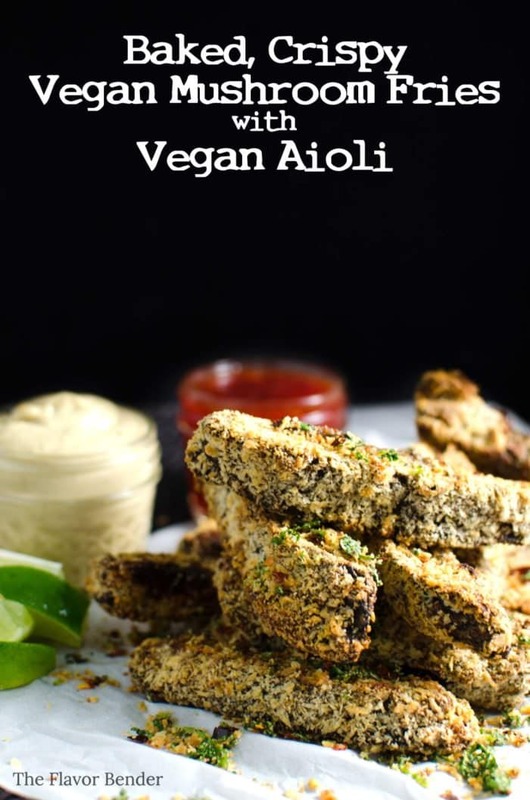 I have tried these vegan mushroom fries both baked and fried. So you always have the option of frying them too. They are just as crunchy and crispy baked as well, so you won’t go wrong with the healthier option of baking them. You might not even notice, but this meal gives you TWO MASSIVE helpings of two different vegetables (per person). Mr K made these a complete meal with a salad on the side, which means any meat lover out there would enjoy these without ever missing the meat. I used a spiced vegan “egg wash” and a spiced cilantro salt to coat these vegan mushroom fries which gave them such an irresistible flavour. 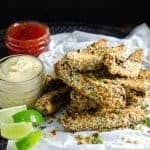 If you’re entertaining vegan guests, these would perfect as a snack for parties or as a game day appetizer, or even a complete meal. Cut the large eggplant in half, lengthwise. Score the flesh. Sprinkle some salt and drizzle a little oil on top. Place it on a baking sheet with the garlic, and bake in the oven for about 20 minutes, flesh side up, until the flesh softens and starts to brown. Take it out of the oven, remove the garlic and flip the eggplants, with the flesh side down and bake for a further 20-30 minutes. The eggplant should be completely softened. Let the eggplant cool down (flesh side down). Once cool enough to handle, scoop the flesh in to a bowl. Squeeze some of the lemon, add about 1/4 cup of the oil, and squeeze the softened garlic into the eggplant flesh. 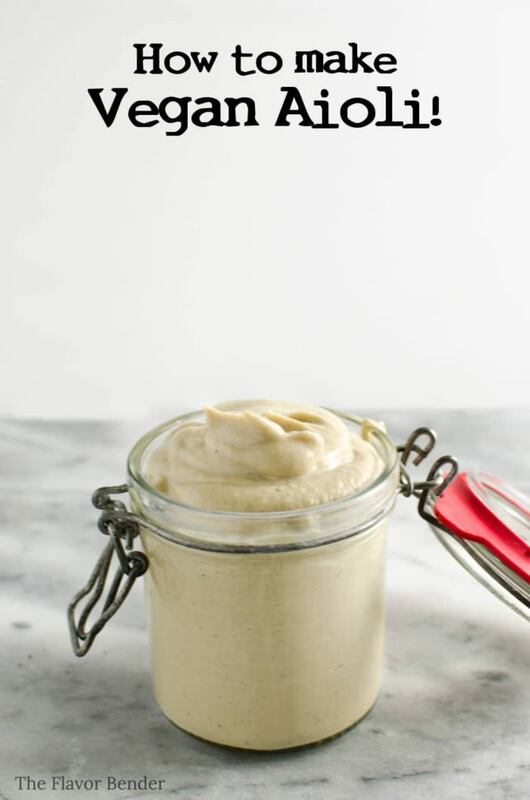 Transfer to a food processor and process until you have a smooth creamy paste. (You can use a hand blender for this as well). Add more oil, if needed only. Mix in mustard (if using). Taste and season with extra salt and lemon juice if needed. Store in an airtight container and in the fridge until needed. Preheat oven to 375°F/200°C. Line a baking tray with parchment paper. Set aside. Place the first 6 ingredients of the spiced “egg wash" in a small food processor and blend till you get a smooth paste. 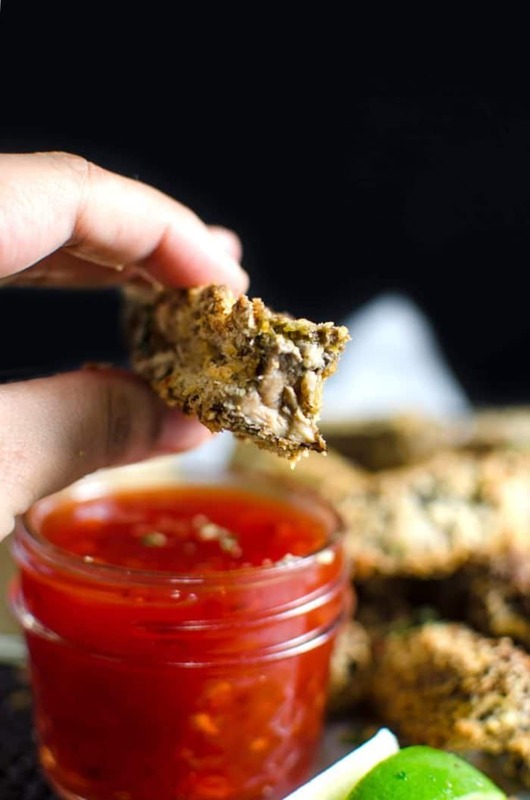 Add the oil, a generous pinch of salt and ½ cup of plant based milk to thin out the mix so you have an egg-like consistency to dip the mushroom fries (the chia seeds will thicken the mix, so add liquid as needed to the consistency you need). 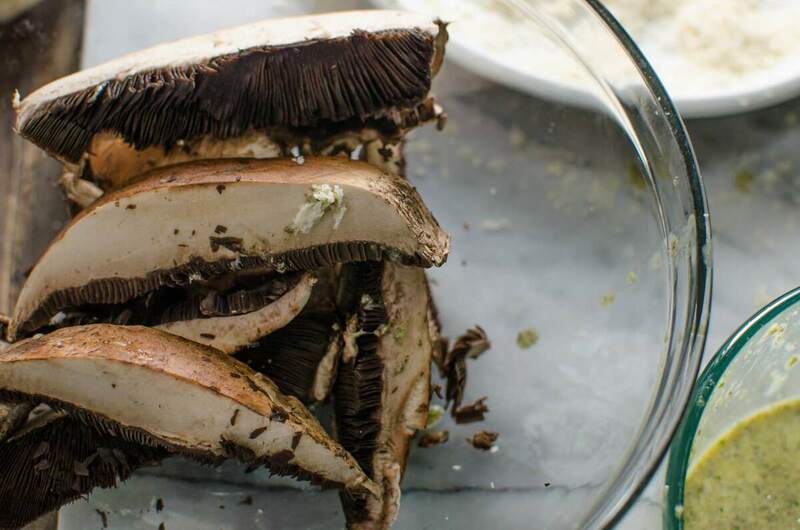 Slice the large portobello mushrooms into ¾ inch thick slices. Place them in a bowl and sprinkle some salt and toss to combine (the salt is optional). Dip each piece of the mushroom in the “egg wash” and coat well. 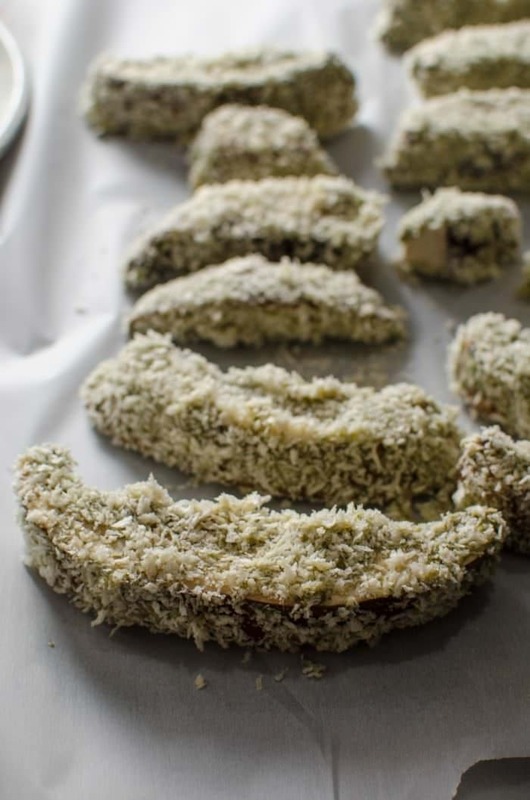 Then place it in the panko crumbs and press the crumbs onto the mushroom till it’s well coated. Repeat for all the mushroom slices. Place the coated mushroom slices on the lined baking sheet in one even layer. Spray them with the oil spray, and flip the fries and spray the other side with oil spray as well. Bake till they turn golden brown - about 15 minutes. Flip them over and bake for another 15 minutes. Flip them over one more time to bake for a further 10 minutes, to make sure all the surfaces are crisp and are baked to a golden brown. Remove from the oven and transfer the mushroom "fries" to a large bowl. Sprinkle spicy cilantro salt on top and toss to combine. Serve with the aioli and sweet chilli sauce. 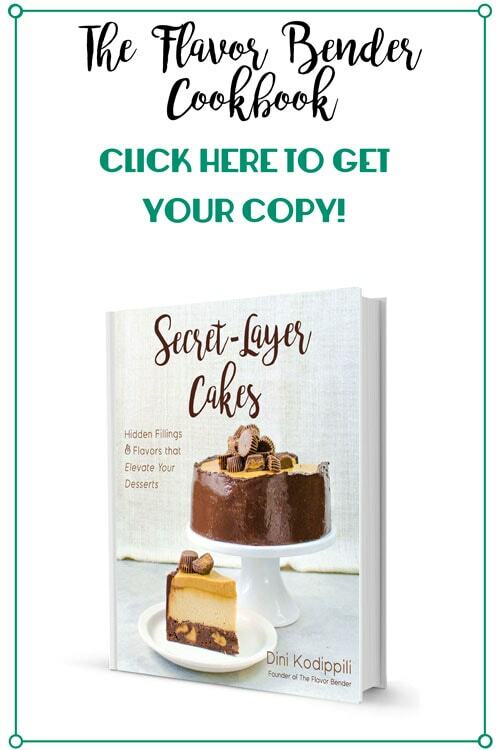 If you liked this recipe don’t forget to subscribe for new (and free) recipes by entering your email address below or on the side bar (and get all these recipes delivered straight to your inbox), so you don’t miss out on a thing. You can find me on FACEBOOK, TWITTER, INSTAGRAM, PINTEREST, YOU TUBE and GOOGLE-PLUS too. I noticed that 1/2 cup plant milk is listed twice in the ingredient list for the egg wash – is that correct? The first 1/2 cup is necessary for the “egg wash”, but the second 1/2 cup is only used to thin out the “egg wash” if it’s too thick 🙂 I hope that helps! I’m not vegan but these fries with the aioli sound so good. Great great recipe. 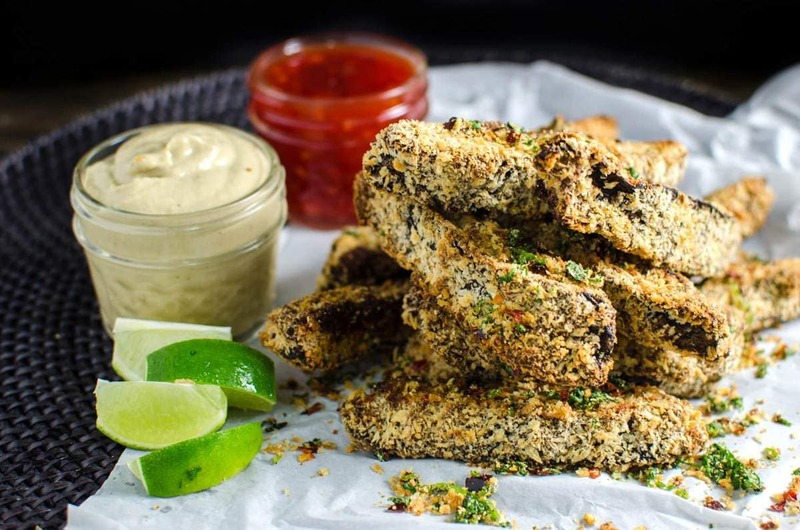 I’ve never tried mushroom fries before, but now I am definitely going to! Your photographs are so beautiful and the dish looks super YUMMY! Now my mushroom loving OH woud just adore these. With each dip you take in that GIF, my mouth spontaneously opens. AWESOME!! OMFG. I have mushrooms. I am so making these. AMAZING. I’ve made the ‘decadent’ version of this dish and wold love to try a healthier version! Oh I love mushrooms. I only have one kid who likes them too, so whenever I make them, we get them all! This looks delicious! What an interesting recipe! I’d definitely eat that! I don’t eat mushrooms, but this might change my mind!!!! My hubby is going to love me extra long when I make these for him!! You are such a mad genius in the kitchen!